Lest we forget the animal victims of war. Hardly a conflict goes by without animals in one way or another being used to help those fighting. Many have lost their lives. Their suffering like the soldiers they serve should not be forgotten. During the first world war over 8 million horses and countless mules and donkeys died. 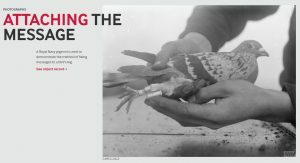 It is estimated that over 100,000 racing pigeons served during World War I and over 200,000 during the second world war. Other more unusual animals have served during conflicts including elephants, camels, oxen, bullocks, cats, canaries and even glow worms! They had to endure heavy shelling and bombs exploding, machine gun fire, as well as poor conditions, hunger, thirst, exhaustion as well as disease and exposure to gas and other chemicals. They were used in all weather from freezing temperatures in the arctic tundra or blazing heat in the Tunisian desert. Despite horrific wounds many of these animals continued their work with amazing dedication, courage and loyalty to their their handlers. No body knows the true number of lives which were saved by these animals. 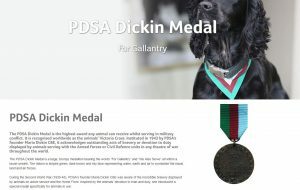 The Dickin Medal was instituted towards the end of the Second World War the outstanding acts of bravery or devotion to duty by animals serving with the Armed Forces or Civil Defence units in any theatre or war across the world. It is considered the animal version of the Victoria Cross. Since 1943 the medal has been awarded 71 times as well as 1 Honorary medal which was awarded in 2014. The recipients comprise 34 dogs, 32 pigeons, 4 horses and 1 cat. But there are many more which served and lost their lives which are also remembered at a national monument at Brook Gate, Park Lane, London W1K 7QF. At WRAS we will never forget those animals who suffered for our freedom, as well as the soldiers who served with them. 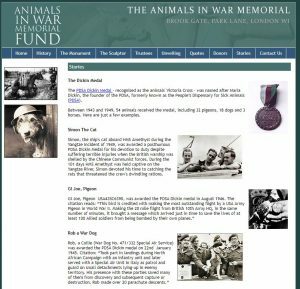 More information and stories of animals at war can be found at the following websites, click on the image to be directed to their websites. You may see different coloured poppies being worn during remembrance. This short article by the BBC help explains more about the colours and their meaning. Posted in Events, Newsletters, Rescue news on November 10, 2018 by East Sussex WRAS.